Which ones are your feet? “My feet look like meat-filled pastries,” said C, as she looked up at her legs, which were up on the wall as she laid on the bed, an L-shape familiar to many cyclists and athletes in general, especially those who are prone to swelling or build up of lactic acid. C is all of those things, and we’d just come back from a super early hike, the kind of hike only gluttons for punishment go on, the kind where you wear three pairs of pants, and a headlamp and trudge up into the black, black night, waiting for the sun to cast its first rays on a giant granite spire (see above, Mt. 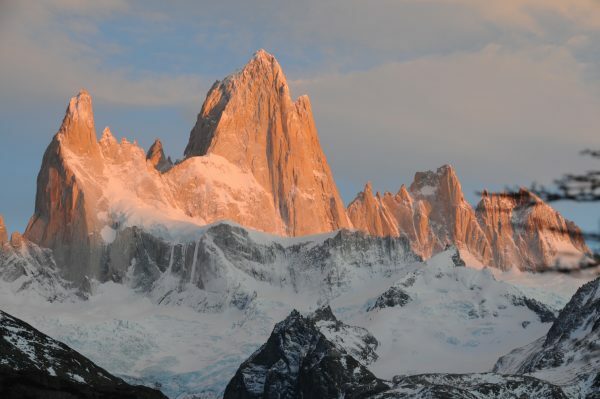 Fitz Roy in El Chaltén, Argentina, part of the Parque Nacional de Los Glaciares). But back to C’s feet. What’s written above is not actually what she said. She said her feet looked like empanadas. This was the first time I’d heard about feet looking like empanadas, but the famous “empanada hand” is common enough in Chile. When your hands are swollen, or if someone has big, meaty hands, these are “manos de empanada.” (Side note, I never know where to put the punctuation when I’m writing a bilingual sentence. On the one hand, in American English, it goes inside the quotation marks. On the other hand, in Spanish it goes on the outside. I usually defer to the rules of the main language of the sentence, but sometimes, like now, I spin off on a tangent in my head. And luckily the punctuation goes outside of the parentheses in both languages). So what is this, empanada-hand, empanada-foot? What does it mean? Well, like all things, it’s cultural. 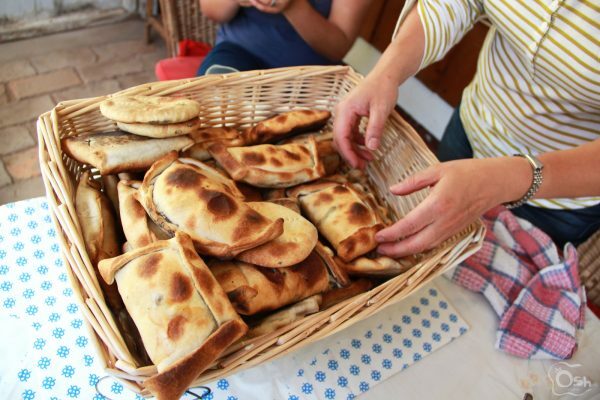 Empanadas are rounded, with no discernible topography, no ridges or “relief” where I mean “relieve” not “alivio.” So when your feet or hands are swollen such that knuckles and bones and whatnot are obscured, you have “manos de empanada” in Chile. What’s funny here is that we also have a (meat) food-related expression for extremity swelling in English. My fingers look like sausages, we say, in English. Or maybe toes. So just the digits, not the whole extremity. Is it because our hands don’t swell in English-speaking countries, or that we just notice it more in the fingers? As far as I am aware, we do not have empanadas filled with sausages in Chile, though there is the chaparrita, which is a hotdog wrapped in empanada dough, similar to a corn dog, but no corn, and also no stick. And I have never heard anyone say they had dedos de chaparrita. Chaparritas also, I’m told, have cheese in them, making these some kind of cheese steak corndog crossover, which I believe is most popular among consumers from about age 4-24, and then interest quickly drops off. So if you’re a hiker, or a cyclist, or otherwise prone to swelling of extremities, and you are from a non-empanada or non-sausage or non Spanish or English-speaking culture. What other foods do hands and fingers, feet and toes look like? Or do they (gasp) look like something totally un-food related? Photo from the hike, which made it totally worth it, swelling of extremities notwithstanding. Better to have manos de empanada than manos de mantequilla. Haha.